Rot, rust, splintering and corrosion may take root on your gate at some point, which is because it is continually exposed to the elements. Rain, heat and cold are but a few of the challenges that your gate’s structure will face, while accidents and ageing are another matter altogether. In each situation, damage can leave your gate inoperable, unsecure or unattractive. In each situation, you can call on us to have your driveway gate fixed by an experienced technician. Many of the components associated with automatic gates will be damaged from wear and tear or weathering as time goes on. If your electric gate is not closing, you may have a problem with your motor. For assistance with having motors and other automation equipment repaired or replaced, contact our consultants today. Many of the most crucial components on your gate are the most overlooked. Bearings, track hinges and gate wheels need repairs or even replacing from time to time since they constantly operate under immense pressure. 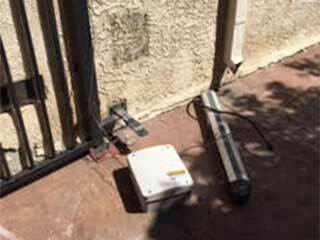 Their failure can make your gate inoperable, or even render it unsafe to use. Call us now to have these components seen to in good time. Let our team of experienced technicians assist you with seeing to the protection and accessibility of your home. If you are in need of professional and reliable gate repair services at your home, contact one of our consultants at Garage Door Repair Los Angeles today for further details on our offers. We are waiting for your call.